Forward walk overs - set 4-6 hurdles out with no space in between them. Put the height setting at one of the lowest settings, ideally just below hip height. Step over the first hurdle with one leg, then step over the first and second hurdle with your next leg. Every stride should clear 2 hurdles without hitting them. The focus here is to keep hip height tall and keep hips pointing straight the whole time, without turning them. Straight leg walk overs - set the hurdles out the same as the above two exercises. Keep legs straight throughout the whole exercise. Swing legs around the side corners of the hurdles and put it back on the ground in front. Clear two hurdles at a time. Hurdle walk over - set 4-6 hurdles out with between 4-6 strides distance between each hurdle. Walk between each hurdle. The aim is that you clear the hurdle focusing on proper hurdle technique. Bent knee - set out 4-6 hurdles with no spaces between them. Clear the hurdles whilst facing to the side and not forward. Clear the hurdles with the foot clearing the side and the rest of the body a foot or two away from the hurdle. Keep the knee bent whilst clearing the hurdles. Straight leg - set out 4-6 hurdles with no spaces between them. Clear the hurdles whilst facing to the side and not forward. Clear the hurdles with the foot clearing the side and the rest of the body a foot or two away from the hurdle. 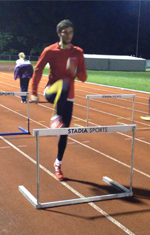 Keep the leg straight whilst clearing the hurdles. Hurdling - set out 4-6 hurdles with 4m in between. Skip in between each hurdle and skip the correct hurdle technique over each hurdle. Trail leg against wall - set out a hurdle about 1m away from a wall or similar surface. Place the hurdle height at the athlete’s appropriate race height. Put the normal lead leg 1 pigeon step in front of the hurdle and to the side leaving the trail leg behind the hurdle. Placing your hands on the wall or surface perform the trail leg action over the hurdle several times. Double hurdle hip raises - place 2 hurdles together with no space in between them. The first hurdle is to be low whilst the second hurdle is to be high. Place one leg in between the two hurdles with the other leg behind the first hurdle. Place hands on the second hurdle and face forward at all times. Bring the rear leg over the first hurdle, touch the top corner of the second hurdle and bring back behind the first hurdle repeatedly. Do this for both legs. Sideways - place 6 hurdles together with no space in between them, alternating each one between highest height and lowest height. Facing sideways, step over the low hurdles and step under the high hurdles. Forwards - place 6 hurdles side-to-side as opposed to front to back, with no space in between them. Put the hurdles up to the highest height. Facing ‘down the line of the hurdle tops’, stand to the side of the first hurdle. Step forwards and ‘through’ the hurdle so that your body follows your front leg under the hurdle. Remaining in the same position that you reached with your first stride, perform the same action through the next hurdle, trying to maintain balance and not make contact with the hurdle. These drills are used to isolate either the lead leg or the trail leg. To do this, an athlete will travel down the side of the hurdle with the leg they wish to isolate in the lane of the hurdles and the other leg in the next lane outside the hurdles. An athlete would then travel (either walking, skipping, jogging or sprinting) down the side of the hurdles performing the isolated skill. This allows an athlete to focus on improving technique for either movement without having more movements to distract.